A supposedly second-division wine is finally earning the respect it deserves. Internationally relegated to quaffing status, the wine world is finally starting to give grenache the respect it deserves. I doubt that grenache devotees are that concerned. Sometimes it’s best not to say anything about a bargain. But if we were issuing a tutorial on how excellent wines can be misjudged to create what might be called a mispricing opportunity – a bargain – it isn’t necessary to look much beyond the grenache variety. Those in the know have long enjoyed the wines of the southern Rhone region of France, whether easy-drinking Cotes du Rhone or profound Chateauneuf du Pape. But in my opinion, the Holy Grail of grenache, and my favorite wine village in all France, is Gigondas, with a population of only about 700. To experience authentic grenache, and a true representation of terroir, which encapsulates the French approach to wine encompassing an almost metaphysical circle of soil, nature, appellation and human activity, you should try a Gigondas. If a blueprint were needed for planting grapes on the barren terrain of Mars, Gigondas is the place. 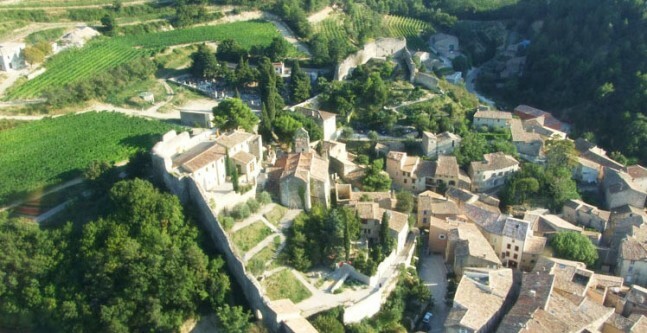 It is a patchwork of precipitous, terraced vineyards at the foothills of jagged limestone peaks called the Dentelles de Montmirail. It was formed in the Jurassic period and eroded over 200 million years by the fierce mistral winds. In 1956, frost wiped out the last centuries-old olive trees, leaving only the vines. It has been strictly monoculture ever since. Even goats struggle to exist. In Roman times the village was called “Jocunditas” or ‘merry city”, also translating in Latin as ‘joy or rejoicing’. One can only assume the Centurions of the Roman 2nd Legion during the 1st century AD thought the place entirely pleasant and were well aware of, and appreciating its wines in those days. Gigondas has not lost any of its charm and it is easy to spend all day wandering around the narrow medieval streets, admiring ancient houses and the Romanesque 11th-century Ste Catherine’s church and 10th-century Chapel of Saint-Cosme. 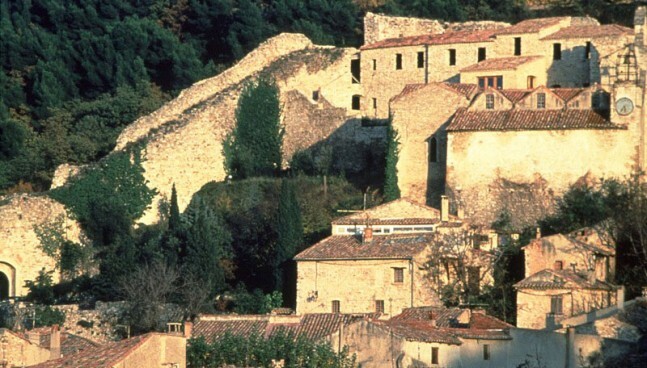 Standing guard over the village and vineyards below, the vestiges of ancient fortifications extend up from the rocky ridge high above to the ruins of the castle of the Princes of Orange. But, despite its thousands of years of history, Gigondas remains relatively unknown and one of the great wine bargains of France. The vineyards begin on the alluvial plains adjacent to Vacqueyras and rise to more than 500 meters on the limestone-terraced slopes of the Dentelles de Montmirail. There is significant variation in the grapes at different altitudes and consequently the style of wine, depending on the producers’ vineyard holdings. Gnarled old vine grenache is perfectly suited to this hot, windy climate and with no irrigation, yields are low, with the vine roots reaching deep in search of water, minerals and nutrients. Under the Appellation Controlee, grenache can make up to 80 percent of the blend. A minimum of 15 percent syrah and mourvedre and 10 percent cinsault and clairette are permissible, although these last two varieties are losing favor. Mourvedre can be more difficult to ripen, preferring the warmer plains, but it plays a central role in the signature garrigue (an indistinct term meaning an alluring aroma and flavor of baked earth and Provencal herbs) and gamey elements that better producers are achieving. Syrah’s main function is to enhance structure, but it does add some subtle seasoning. There are the profound, full-blooded wines with untamed power, teeth-coating tannins, liquorice and a rustic nature, sometimes bordering on feral. These hand-to-hand combat wines are the perfect ordinance for Sichuan Restaurants. A decade in the bottle will tame this however they do take on a tarry character and the rustic character only becomes rustier. Some of the vineyards produce what is becoming known as “international” style, chasing the Australians and catering to the American market. They are impressive with their power and concentration of sweet fruit and seductive, toasty vanillin from maturing in new oak barrels. They are inky and disjointed in their youth and benefit greatly from five to 10 years in the bottle, becoming more integrated. You can be assured they consist of very old vines, or selected parcels high in the Dentelles de Montmirail. However, these winery-manufactured “super cuvees,” a contagious obsession from Chateauneuf du Pape, are starting to achieve disproportionately high ratings and prices to match. 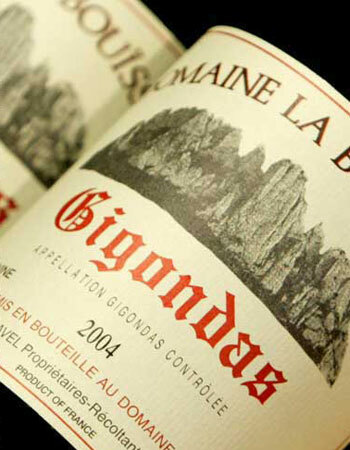 Classic Gigondas are generous, spicy, warming wines. They are luscious in sweet black cherry, blueberry fruit, layered between spices, garrigue and liquorice. Normally matured in old Burgundy casks for two or more years, they have a natural firmness from grape tannins and long finish. You can approach these wines in their youth, a perfect balancing act with rich casseroles. However, a minimum of five years in the bottle and 10 for the best vintages will allow the wines to develop more complexity and secondary flavors. Then there is the old-style Gigondas, oozing personality and seductive with aromas of raspberries, kirsch and violets and subtle garrigue. These wines are “made in the vineyard” with minimal intervention in winemaking and matured in large old oak casks that impart no wood flavors. The integration of sweet berry fruits, garrigue and spices, bound by dusty tannins and silky viscosity is the perfect expression of the terroir. While enjoyable a few years after bottling, the metamorphosis of the primary aromas and garrigue into captivating complexities of leather, pipe tobacco, musk, undergrowth and truffles are the rewards of extended bottle age. Call me old-fashioned, but this is the style I enjoy most. It is comparable to the silky, seductive qualities of fine red Burgundy. Illustrating my point, dining recently in a Melbourne bistro at the invitation of a prominent Australian wine merchant, I ordered two bottles of 1999 Domaine de Cayron Gigondas (old style) to be decanted out of sight. He picked it as Grand Cru Burgundy, probably Chambertin with some bottle age. When I revealed its origin and that it was A$60 (HK$354) on the list, he was perplexed by the quality and value of the wine, proclaiming it an absolute bargain up against a Grand Cru that would cost around A$500. Gigondas has enjoyed a run of excellent vintages with the quartet of 1998, 1999, 2000 and 2001 all worthy of buying. Older vintages to look out for are 1995, 1990, 1989, 1985, 1979 and 1978. I would avoid 2002 and 2003. The south of France was devastated in an apocalyptic 600 millimeters of rain in September 2002, unfortunately right on vintage, and most of Europe experienced a brutal heat wave and drought in 2003. The extreme weather blocked the maturity of the vines. I would suggest initially purchasing a bottle of each and trying them with some friends, served blind – mask the bottles or decant – and see which style is to your taste. 2001 Santa Duc Gigondas Les Hautes Garrigues Cuvee Prestige HK$550 per bottle. International style – 50-year-old vines grown on the hills known as Les Hautes Garrigues. 1998 Brusset Gigondas Les Hauts de Montmirail HK$390 per bottle. Classic style – from vineyards at the foot of the calcareous ridge of the Dentelles de Montmirail. A great year. 1999 Domaine du Cayron Gigondas HK$340 per bottle. Old style Gigondas – and one of my favorites. 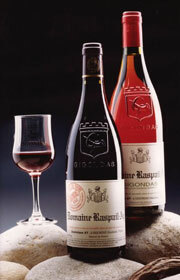 I have yet to track down in Hong Kong my absolute favorite, Gigondas vigneron, Domaine Raspail-Ay. Old style, of course. A double magnum of 1990 would be my desert island wine.